CK Vineeth is one of the best Indian strikers at the moment, the man from God’s Own Country has been showing his skills and prowess on a daily basis for the last couple of years. He has not only improved by leaps and bounds and have come a long way from the time he joined Bengaluru FC, but winning matches and trophies for the Blues and the Yellow Army single handedly. Considering the amount of workrate, CK has been the best Indian player in the ISL last season as well. Well, we could only say this much to say the least about the “Malayali Maverick”, CK Vineeth. Jersey: Firstly, Vineeth thanks for getting out the time for us, tell us, how did it all start for you in football? Vineeth: I started playing football from a very young age and was a regular for school and college team, before I joined Chennai customs initially and honed my skills for two years there. Then I moved to Kerala State Electricity Board and I actually started taking my football career seriously and I was grateful to the coaching staff there to make me what I am today. Jersey: At the start of the career, like many of your famous seniors like Vijayan, Ancheri, Satyen and others, you came to Kolkata to join United SC, though you never played for the Big Two(Mohun Bagan & East Bengal). So, how was the experience? Vineeth: Yes, It was a wonderful experience, though I did not play for the Big Two but United was a big team at that time and the management was a treat to work with. I played with big players like Ranti, Vincent and Hernandez. I got trained under very good coaches. Garcia was also there as our physical trainer and he was simply superb. Jersey: You played with Hernandez while in United, how was the experience playing with a World Cup winner? Vineeth: The only problem was that he was not at his fittest best but even without being at top condition he was better than many I have played with over the years. He had tremendous vision and had a wonderful set-pieces. I learnt a lot from him. Jersey: Due to financial difficulty then you had to leave United to join Bengaluru as it came in news, Is that news correct? Vineeth: No, it was not due to financial difficulty, it was more of my decision where I wanted to step up and be in a big club and prove my worth in the I-League. I was impressed with the professional set-up here and as soon as I got a chance, I took the offer. Jersey: You have spent four seasons now with Bengaluru, have worked with arguably two of the best foreign coaches to set foot in India, How has been the experience working with both Westwood and Roca? Vineeth: They both are completely different, as you know one is Spanish and another is English. Rocha loves to play with the ball at the feet all the time, while Ashley was more direct in his approach, he was more aggressive on the touchline and was expressive, while Rocha is that calming influence and silently controls the game we play. All in all it has been a learning experience and has been an ultimate pleasure. Jersey: An interesting fact about you Vineeth, you have been fortunate to have always been under foreign coaches, which is a unique record in itself? 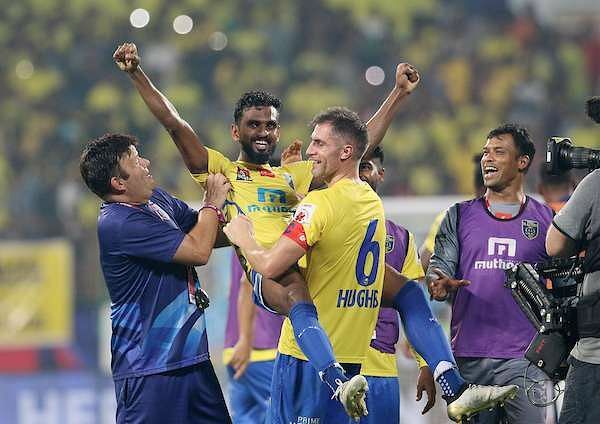 Vineeth: (laughs) Yeah that is true, I will tell you, I have played under Eelco in United, Ashley in Bengaluru, and Rocha in Bengaluru, Stephen, Bob and Wim for the national team as well Peter Taylor and Steve Coppell for Kerala Blasters. Jersey: Getting to that, Steve is a huge name in English Football and much respected figure in the footballing circle world-wide. How was your experience with him? Vineeth: See in a way, both Rocha and Steve are similar in nature, they would not shout or get angry or throw tantrums at you. They would come up to you and calmly point out the strategy, your mistakes and how to win the game. They would never get angry; they always have this calming influence on everyone and instil that much needed confidence in the players. Jersey: Throw some light on your relationship with Ashley Westwood? Vineeth: Ashley is completely different. Ashley will be angry and shout at you and show a lot of passion. But as players we loved it, he was an excellent man manager and was a person who will get us motivated and pumped up as well all the time. Jersey: So, tell me is there anyone amongst all these wonderful coaches whom you think inspired you the most? Vineeth: (Laughs) I would not like to name only one as that will be disrespectful to others as I have learnt from each and every of these managers and all of them helped me to improve immensely. Jersey: You have played with some of the best strikers to play in India, especially Sunil Chhetri, how has been that experience playing alongside him? Vineeth: He is not only a leader, he is a big brother, and he is right now an icon and brand in Indian football. He is down to earth, motivating everyone and being the ideal big brother taking care of everyone all the time, not only on the field also off the field. Jersey: Coming to Bengaluru FC, you have an important AFC Cup match, you are finalist from last time at the big Asian stage, so do you as a team feel any pressure as people are expecting silverware this time? Vineeth: We love pressure, we believe this is positive pressure and helps us in excelling on the field to achieve greater heights. We love the pressure here in Bengaluru FC. Jersey: Tell us something about your loyal West Block Blues, some words for them? Vineeth: Oh, they have been special! You have seen the Federation Cup final and their reaction, and it says it all. They are an integral part of the BFC family and without anything much would have mattered. They are very special for all of us and their passionate support inspires us to perform wonderfully on the field every time and give our all. We always feel blessed to have their support. Jersey: (laughs) Another tricky question for you, apart from the Big Two fans you have been part of two clubs, who have arguably the most passionate fans i.e. Kerala Blasters and BFC, any preference or share your experience? Vineeth: (laughs) Both set of supporters have been special; this kind of support inspires us players to do that extra bit for the clubs. The basic difference has been while WBB is less in numbers they are very organised and well-orchestrated while Blasters fans are huge in numbers but a little disorganised. But one thing is for sure, these set of fans are class apart, they are gems and it is sheer pleasure to play in front of them day in and day out. Jersey: Vineeth, this season, BFC did not play to their full potential for some reason. What ido you think was behind it? Vineeth: See I really did not know the exact reason, somehow it did not click for us whole season, maybe too many matches without any rest, continuous football, we did not click. We played like shadows throughout the season except for the Fed Cup final, literally we played only one match to our true potential the whole season and we got silverware. Sometimes it just happens. Jersey: I know, you are in love with BFC and Kerala Blasters, but is there a chance of seeing Vineeth in a Green and Maroon or Red and Gold jersey in the near future(As they are two biggest clubs in the history of Indian football)? Vineeth: I would love to be there and feel the love of the fans of Kolkata. Though they have always tried to irritate me whenever we have played against them, but I still do love the fans and their passion for footballers. But you know what, I did get a couple of offers before from Mohun Bagan but somehow it did not materialise. I do feel that I have still not got matured enough to handle the extreme passion of fans there in Kolkata. I can manage the Blasters and BFC fans but sometimes I think I am yet not fit to take on the Kolkata crowd who are extremely passionate and sometimes have insurmountable expectations from the players. Supporters need to realise that players never want to lose but that is not humanly possible. Jersey: Take us through your journey with the Indian National team. Vineeth: It has been a pleasant experience and the biggest joy to represent the country. But I am not happy personally as I am still not been able to seal permanent berth in the National team and it is no one’s fault but mine. I need to work harder and improve my game to be a permanent fixture in the national team. It is simply incomparable the experience of representing the country. It is awesome to say the least. Vineeth: No, it’s my decision and my contract is over with BFC now so then when everything is clear on 7th June, I will take a final call as per the offers I get. I am a free player now. Jersey: How are your talks going for playing in Europe as your contract ends here? Vineeth: I am open to it but I will need to play regularly even abroad as I am not 23-24 to just sit on the side-lines and gain experience. I need to play regularly wherever that be. But quite frankly I don’t think I am that good to play abroad at the moment and I am taking one day at a time and look to perform my best wherever I play. Jersey: How is Vineeth as a person, not as a footballer? Vineeth: (laughs) Uou need to tell me that!! Quite frankly, I am just a normal person who wants to spend as much time with my family. I love to drive as well as I am an avid photographer. These are my passions, moreover I love home cooked Malayali food and crave for it as when I am with my clubs, we have heavy restrictions on our diet and I can’t tell you how much I miss it. Jersey: Tell us some of the young prospects in BFC, how do you feel about them? Vineeth: BFC is a nursery for the budding talents, there are many like Udanta, Nishu, Daniel and Zuala who are bright prospects for the future and they are top class. Moreover let me tell you we have around 10-12 under 22 players who ,if they work hard will be the future of the club and the country in the years to come. Jersey: What are the biggest moments in your football career? Vineeth: The biggest moment was when I played for India for the first time. The second one was a mix of good and sad when we lost the ISL final in front of the home crowd, it was sad but a huge moment for my career and I have to remember that to get better. Jersey: How was the experience with a big player like Aaron Hughes, who’d just had an amazing run in the Euros before he made it into ISL? Vineeth: It was an absolute pleasure and he was a true captain, magnificent leader of men. Learnt a lot from him and I am still in touch with him and keep him posted with my career graph. Jersey: Tell us, do you think there are more stars coming out of Kerala after CK Vineeth? Vineeth: There are few players in the U-17 national team, few players who are playing in various I-League clubs like Shibinraj and Anas in Mohun Bagan, Reheneesh in East Bengal, Rino in BFC and many other. Kerala still has lot of talents but most of the players do not get opportunities back home as there is no I-League clubs from there. I want to start an academy after I retire to make sure I get proper opportunity for the passionate people of Kerala and get chances in football. Simply put until you have to have clubs in I-League to have more players from our state. Jersey: Do you know that your friend Anas Edathodika drives all the way from Kolkata to Mallapuram? Vineeth: Oh!! That is a Mallu speciality!! Even I love to drive and whenever I get a chance I take out my Bullet and go on for a long drive. Just like Anas I also want to drive and if I am in Kolkata I will also drive all the way to Kerala. We don’t like flights I guess it’s pretty boring. Jersey: One last question, who has been your idol? Vineeth: My father, he has been my inspiration life-long and been a tremendous support. My whole family has always been supportive of my football career. Jersey: Thanks a lot Vineeth it was simply awesome talking to you, all the best in your future endeavours and hope to talk again with you soon. Vineeth: Thanks a lot and it was a pleasure here as well.